Home prices are still surging, but the pace of the gains has steadied as interest rates continue to rise. Prices for homes in the nation’s 20 largest cities in June rose 12.1% over the last year, according to a report Tuesday from S&P/Case-Shiller home price index. While that gain is still robust, it didn’t quite match the gain of 12.2% reported for May. Rising mortgage rates may be to blame. “With interest rates rising to almost 4.6%, home buyers may be discouraged and sharp increases may be dampened,” David Blitzer, chairman of the Index Committee at S&P Dow Jones Indices, said in a press release. Home prices have been on a tear for the last twelve months. June marks the first time in over a year that the overall increase has been smaller than the month before. 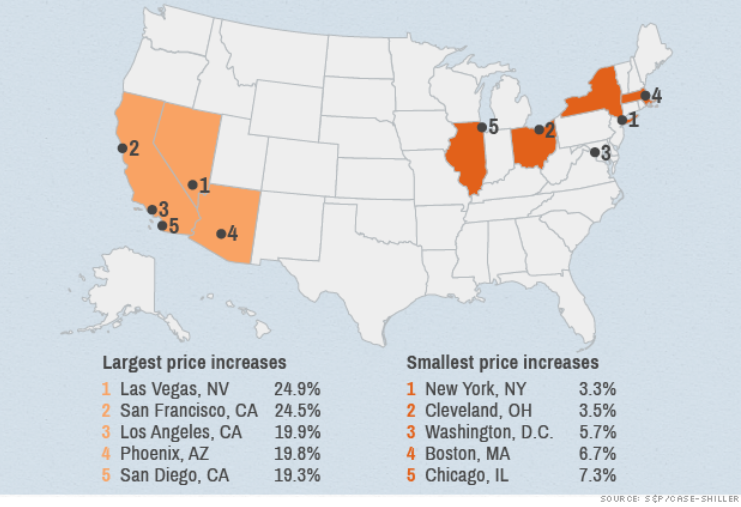 While prices rose in all 20 cities measured by the index, only six cities in June saw price increases larger than the month before, down from 10 cities in May. Prices in Dallas and Denver hit all-time highs, while San Francisco housing prices notched the biggest rebound, rising 47% from their low in March 2009. U.S. home prices are now at early 2004 levels — still 23% below their peak in mid-2006. And while mortgage rates have been steadily rising for the last few months, they’re still at historically low levels. Record-low rates, a lack of new homes on the market and years of pent up demand have been the driving forces behind the recent home price spike, according to Erik Johnson, senior U.S. economist at IHS Global Insight. The recovering housing market has been a big part of the nation’s economic recovery since the Great Recession. But many fear that rising mortgage rates could put a damper on that growth. Rates have risen more than a full percentage point since May, when Federal Reserve Chairman Ben Bernanke indicated the Fed may soon ease its bond buying program that’s helped keep interest rates at record lows. While some cheer the Fed stepping back from its unusual bond purchases amid fears the buying will spark inflation, others worry that it may be too soon.